I’m back home from Dallas! The shoot was a lot of fun, but I was semi-delirious from lack of sleep. My hotel was situated directly in front of the train station. The rumbling, clanging, banging, and squeaking began at 12:45 and never stopped. The fun of television. I spackled on the makeup come morning-time to hide the dark circles. Seems to have worked! Preheat oven to 350°F. Spray cookie sheets with nonstick cooking spray. 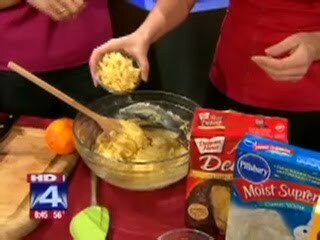 Break up the cookie dough into a large zipper plastic bag; let stand for 10–15 minutes to soften. Add the white chocolate chips, cranberries, almonds, orange zest, and spice to the bag. Squish the bag with your hands until blended. Drop dough by kitchen teaspoons, 2 inches apart, onto prepared cookie sheets. Bake for 10–13 minutes or until just set and golden at edges. Transfer cookies to wire racks and cool completely. Makes 28 cookies. You can use any brand of yellow cake mix, but for this batch I used Naturally Nora’s Yellow Cake Mix. Amazing! Every bite epitomizes autumn. Preheat oven to 350°F. Position oven rack in middle of oven. Spray cookie sheets with nonstick cooking spray. Place half of the cake mix along with the apple cider, oil, cinnamon, and egg in a large mixing bowl. Blend with an electric mixer set on medium-high speed for 1–2 minutes, until smooth. Stir in the remaining cake mix and dried apples with a wooden spoon until all dry ingredients are moistened. Drop dough by teaspoonfuls, 2 inches apart, onto prepared cookie sheets. If desired, sprinkle cookie tops with chopped nuts; gently press nuts into dough. Bake for 10–13 minutes or until set at edges and just barely set at center when lightly touched. Cool for 1 minute on cookie sheets. Transfer to wire racks with metal spatula and cool completely. That must have been so exciting!! Great recipe choices, Ive gotta try those cookies. You are a natural on television! I loved the “squishing” technique — how fun. The recipes look terrific. Congrats!